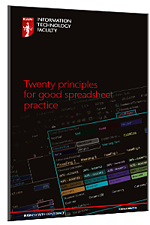 Filtered has partnered with the ICAEW to bring you the 20 Principles for Good Spreadsheet Practice. This handy e-book will teach you the tricks and tips needed to stay clear of the kind of errors which could see you in the doghouse with the powers that be. Fill out the form below to download a copy of this handy whitepaper and you'll be building efficient, error free spreadsheets in no time.